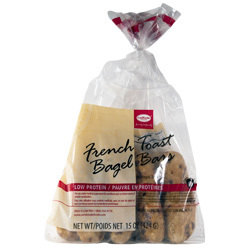 Description: Each package contains 8 - 53 g low protein Bagel Bars, French Toast flavor. These bars are similar to our bagels, but chewier; flavored with brown sugar, maple flavor and cinnamon bits. They are long and stick-shaped. Serving Suggestions: Toast and add your favorite spread. Ingredients: Wheat starch, water, cinnamon drops (sugar, palm oil, cinnamon, nonfat dry milk, soy lecithin [an emulsifier]) canola oil, psyllium powder, polydextrose, sugar, brown sugar, leavening agent (sodium acid pyrophosphate, sodium bicarbonate, monocalcium phosphate), yeast, salt, mono and diglycerides, wheat flour, xanthan gum, modified cellulose, sodium stearoyl lactylate, carrageenan, maple flavor (water, caramel color [contains sulfites], propylene glycol, sodium benzoate [preservative]), natural flavor, turmeric, calcium propionate (preservative), fumaric acid (preservative), sorbic acid (preservative). Contains milk, soy and wheat. Serving Size 53 grams/ 2 oz.